Arrive in beijing, the capital of China.greeted by the local guide at the airport and transferred to the hotel. The highlight today is a visit to the Great Wall, a symbol of the Chinese ancient civilization and to the Ming Tombs, the burial grounds for the 13 Ming dynasty emperors. Attend a Beijing roast duck banquet in the evening. Morning program takes you to Tian'anmen Square and the Forbidden City, the residence of emperors for more than 500 years. Afternoon sightseeing features the Temple of Heaven, where emperors once prayed for good harvests and the Summer Palace, a summer resort for Empress Dowager Ci Xi. Enjoy the China Acrobatic Show in the evening. Morning flight to Xi'an and visit the majestic Wild Goose Pagoda and the ancient City Wall. A full day tour recalls the glories of ancient Xi'an as you visit the burial site of an incredible army of 8000 lifelike terra-cotta soldiers and the ancient Banpo village. At that night, you will enjoy two specialties, Xi'an dumpling dinner and Tang dynasty show at Shaanxi Grand Theatre. Morning flight to Wuhan at the junction of the yangtze and han rivers.Visit the Yellow Crane Pavallion and bus to Yichang to board on the river cruiser in the evening. Visit the 3 Gorges Grand Dam in the morning and attenda welcome banquet on board. Weave through Wu gorge, with bewitching twelve peaks soaring above. Continue to Wushan and boats for a trip up the Daning river to the Three Small Gorges, a stunning area of dramatic hillsides, caves and lush bamboo groves. Arise early for a spectacular journey through the last of the three gorges, Qutang Gorge. this breathtaking narrow passage through misty peaks and sheer cliffs is the grandest of them all. Continue upstream, you arrive at wanxian or Fengdu; you will have a brief city tour to explore the small county along Yangtze river before returning aboard to attend the farewell banquet. Day10Chongqing The cruise arrives in chongqing, the mountain city. Enjoy a short visit to the museum of General Stilwell and the 3 Gorges Museum. Day 11Chongqing/Guilin Morning flight to Guilin and upon arrival there, visit the Reed Flute Cave and the Trunk Hill along the Li river. Spend the day aboard a scenic Li river cruise through the mist-shrouded limestone mountains, passing picturesque farms and fishing villages. Free time by yourself to visit the countryside sceneries or shopping at the west street in Yangshuo. Enjoy a "Comrant catching fish" show in the evening. Afternoon flight to shanghai that is the financial and commercial center of China. Visit the famous waterfront bund and nanjing road at the shopping center. 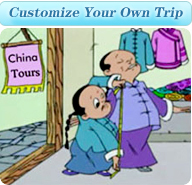 Visit the Yu Garden and Jade Buhdde Temple and the Oriental TV Tower.